In this example, the underlined words or phrases are the keywords/-phrases. Step 2. Use Boolean operators: AND, OR, NOT To narrow a search, use the operator AND to retrieve records which contain two or more terms. The three keywords/-phrases in Example (i) above are searched as in Example (ii) here. Alternatively, use the operator NOT to exclude unwanted words. To broaden the search, use the operator OR to retrieve records which contain either keyword, or both. The two keywords are usually synonyms. To search for records of an exact phrase, put the phrase in double quotation marks (“ ”). To search for records of a group of terms with similar meanings, enclose each group of terms in parentheses ( ( ) ). To search for records of the variants of a term with a common root but different suffixes or suffixing words, use an asterisk (*) as a wildcard or truncation symbol at the end of the term. ➜to generate results of different combinations of words, such as ‘medium of instruction’, ‘medium of teaching’ etc. ➜to generate results of the term with different following elements, such as ‘university students’, ‘university education’, ‘university teaching’ etc. ➜to generate results of the different terms with the common stem ‘universit*’, such as ‘universit-y’ and ‘universit-ies’. A question mark (?) may be used to replace a specific number of characters. E.g. (x) instruct?? or instruct??? ➜to generate results of the terms ‘instruct-or’, and ‘instruct-ion’ or ‘instruct-ors’ respectively. The use of symbols and truncations varies, depending on the requirements of each search engine/tool/database. Users are advised to read the tips/guidelines for search provided on all university libraries’ websites. Step 4. Refining the search: customising the time range (i.e. the years of publication); choosing the types of content or material (i.e. journal article, newspaper article, book/e-book, conference proceedings, videos, dissertation/theses etc. ), the language(s) and the subject terms. When the search results are generated, users can arrange them in ways that help identify useful references. Or ‘sorting by date’, which means to prioritise the search results in a reverse chronological order – the most recent results come first. Notice that strategies may vary according to the format of different search engines/tools/databases. The usage of the most popular search engine, Google Scholar, is illustrated below. 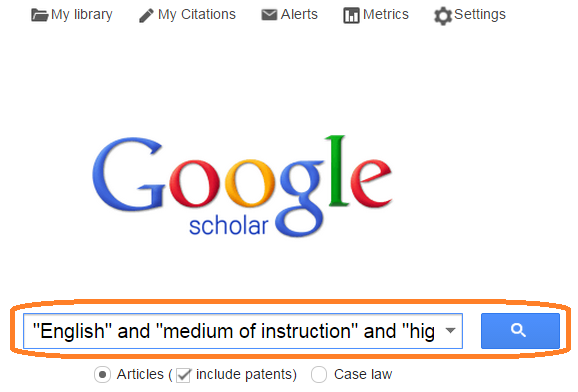 Google Scholar Google Scholar, unlike a regular Google search, limits itself to academic sources. It searches and indexes scholarly literature on the web, including articles, theses, books, abstracts and court opinions. A Google Scholar session performed on campus will automatically link to the full text available at the Library. Whereas to start a search session off campus, you have to link Google Scholar to the subscriptions of any local university library in which you are an eligible user. Step 1. Go to http://scholar.google.com and click on ‘Settings’. You are advised to login your Gmail account if you have one. Step 2. 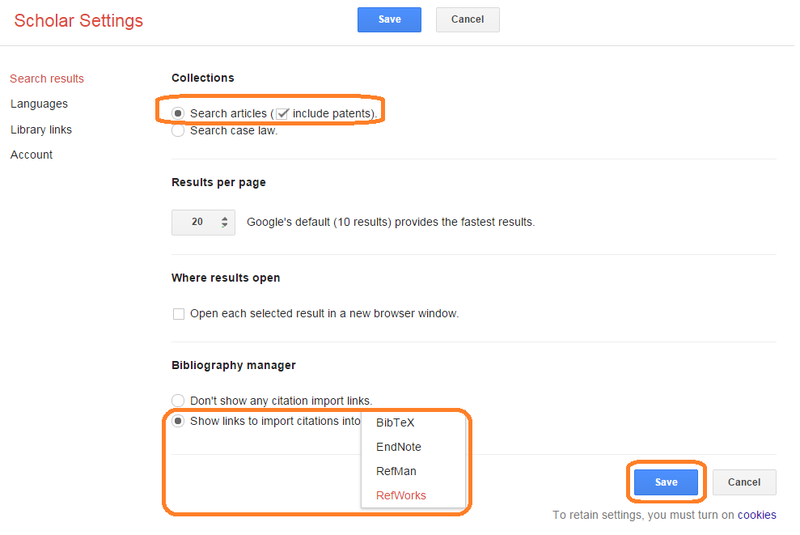 In ‘Search results’ of Scholar Settings, select ‘search articles (include or exclude patents); adjust the number of ‘results per page’; and select the bibliography manager (i.e. BibTex, EndNote, RefMan or RefWorks) to which you may wish to export the citations. You must have created an account of one of these bibliography managers in order to store the citations from Google Scholar. When you perform any Google Scholar search, you must keep the account of the bibliography manager logged-in for successful import of citations. You may want to set your preferred language under the ‘Languages’ of Scholar Settings. Step 3. Go to ‘Library links’ of Scholar Settings, type the name of the university library to which you would like your Google Scholar to link. 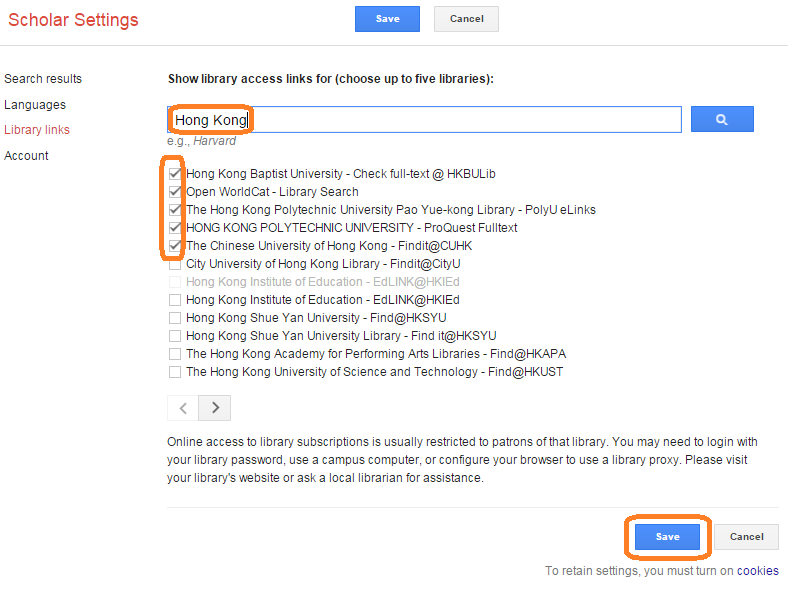 Alternatively, enter “Hong Kong” in the search box provided to show the results of all university libraries in Hong Kong. Check the box of the university libraries to be linked, and click ‘Save’. You may choose up to five libraries. 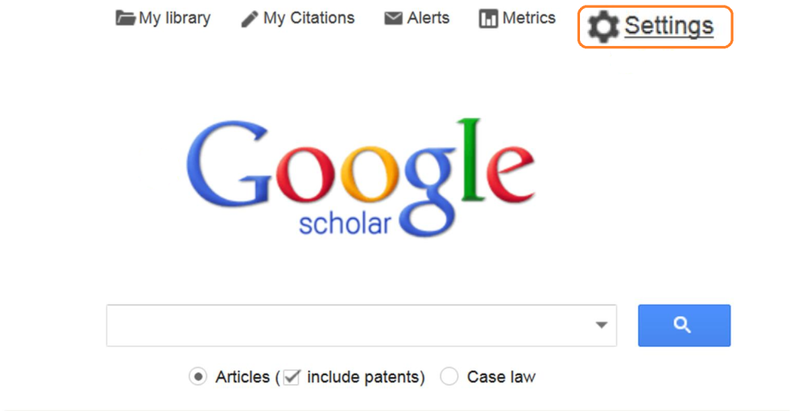 Your Google Scholar is now set up. Let’s begin the search. Step 4. Go back to the front page of Google Scholar, and create a search query by entering the keywords with relevant operators and symbols in the search box provided. 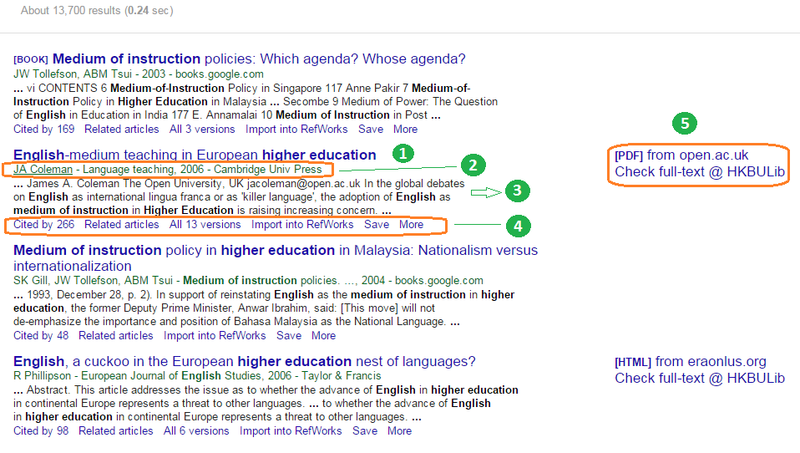 Notice that operators OR, NOT and question mark ‘?’ do not work in Google Scholar. Alternatively, press the ‘downward arrow’ at the end of the search box. The ‘with all of the words’ box is equivalent to the function of AND, in which every single word entered will be included in the search. The ‘with the exact phrase’ box is for retrieving records with a particular phrase. The ‘with at least one of the words’ box is equivalent to the function of OR, which is to search for records that contain any one of the keywords entered. The ‘without the words’ box is equivalent to the function of NOT, in which the words entered will be excluded in the search. 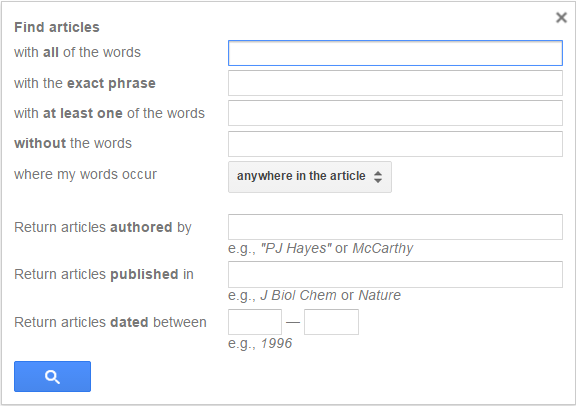 After entering the keywords in the suitable box(es), you may choose the location of keywords at ‘where my words occur’ - either ‘anywhere in the article’ or ‘in the title of the article’. In addition, you may add details of the author, journal and date to get specific records. 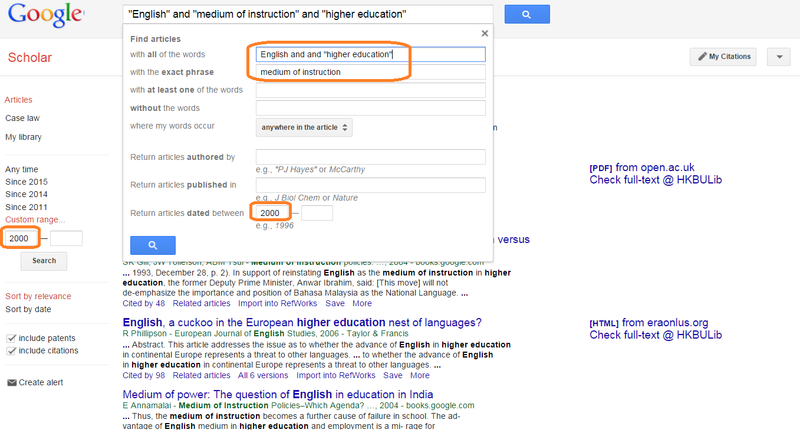 Suppose you are looking for literature on ‘English as a medium of instruction in higher education’ published since the year 2000, you should enter the relevant information in the corresponding boxes in the Google Scholar and click the search button (i.e. the icon with a magnifying glass). Then, you will see that it takes 0.24 seconds for Google Scholar to retrieve about 13,700 results/references according to the search information. From left to right: the author, journal/book and the year of publication, and the publisher or source. You may click on each of these items to find other references related to the item. A short paragraph/abstract of the reference in which the keywords are shown bolded. From left to right: the number of citations, the link for other related articles, the link to export the reference to the chosen bibliography manager, the button for saving the reference in ‘My Library’ of Google Scholar, and ‘more’ links of other chosen library catalogues for further search. The link for the databases in which the material is available in different formats (i.e. PDF, HTML etc.) for viewing or downloading. Google Scholar will also provide another link which guides you to check the availability of the material in your accessible library/-ies. Step 5. Narrow or expand your search by entering different combinations of keywords. to create alerts through emails to notify yourself the newest sample articles once available. Task 1 : Identifying keywords Click on the keywords/-phrases or concepts in each statement provided. Is English a language killer ? Should the retirement age of civil servants in Hong Kong be raised to 65 ? Should students’ achievement be a factor of grading teachers’ performance ? How can companies be merged ? More should be done to protect and preserve endangered animals . Do you agree ? Should guns be permitted for common citizens ? Should university students be required to take physical education course ? Is Euthanasia mercy killing or a crime? Is speed dating a good way of finding a suitable partner? Is Hong Hong people’s English standard deteriorating? Assuming you are going to search for relevant literature for the given title, complete the following questions in order to create a search query in Google Scholar. Title: Is Facebook an effective social networking tool or the end of privacy? What are the keywords or concepts in the given statement? What are the synonyms, related concepts or examples of the selected keywords in Q1? Select TWO versions of search query which are more appropriate to be used in Google Scholar. Title: Should rules on television advertising be relaxed? "rule*" and "regulation*" and "television advertising" and "television commercials"
"rule?" and "regulation?" or "advertis*"
Every tertiary institution’s library has its own search engine, for examples, CityU’s Library Catalogue 2.0, BU’s and PolyU’s One-Search, IEd’s EdCat and LU’s 1-Search. Each search engine has tiny differences on the requirements of keywords, symbols and truncations to be used. You are advised to refer to the library’s website for the detailed guidelines or tips on how to perform searches through their search engine. HKALL is a ‘union catalogue’ grouping massive collections of printed materials, archives and electronic resources available in the libraries of eight partner tertiary institutions for the shared-use amongst eligible staff and students. The materials can be circulated from any one of these libraries to the library of the eligible member’s respective institution after requests are made. All tertiary institutions’ libraries have subscriptions to a number of databases (e.g. ERIC, EBSCOhost, JSTOR, Scopus etc.) which host electronic journal articles and reviews of various academic disciplines. Searches using these library-subscribed databases are different from those in commercial search engines like Google/Google Scholar. Detailed guidelines on how to find relevant articles in these databases can be found on its homepage or on the websites of each institution’s libraries.